My name is Charlotte Royles, I am 27 years old, I am married to Daniel Royles and we have a gorgeous son Riayn Royles who will be four at the end of February. We live in Sheffield. Riayn was a healthy baby who was always smiling and very happy. I went back to work a few months before Riayn’s first birthday, that’s when Riayn started being unwell quite often. Every time Riayn was seen by a Doctor they said it was viral or “he’s teething”; we were given paracetamol for the temperatures and sent home. It went on like this for months then Riayn started crying a lot and not eating or sleeping. On Wednesday 7th October 2009 I picked Riayn up from nursery and they said he’s been really off all day crying and not wanting to walk and he still wasn’t eating. That night I took Riayn to the Children’s Hospital A&E to be checked over; he had another temperature but this time the nurse found a few red spots under his skin. She wanted to monitor Riayn a little longer, we were eventually let home and that night Riayn was at his worst. I couldn’t control the temperatures – he was on paracetamol and neurofen every 3 hours! I eventually managed to settle him and when he woke up a few hours later he started screaming in pain. A rash that looked like a nettle rash covered his body within minutes! Riayn was blue lighted to hospital the doctors thought Riayn had suspected meningitis and swine flu, bloods were taken and he started immediate treatment. A few hours later 2 Doctors and a nurse entered the room and I knew something wasn’t right ! “We suspect your child has Leukemia”!! We were horrified, shocked, devastated, our world had crumbled. The following day Riayn had a bone marrow, Lumbar puncture and intrathecal (chemo) done. On the 9th October 2009 Riayn was diagnosed with Acute Lymphoblastic Leukemia (ALL). We were transferred to the M3 ward where Riayn’s journey began. We were told Riayn’s treatment would be 3 years ! 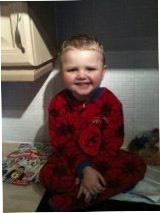 The first 2/3 weeks that he was in hospital he had blood and platelet transfusions and had his portacath fitted. He was then on IV antibiotics as he kept getting infections. He wasn’t well at all and we hadn’t had a smile off him for a week or so which wasn’t our Riri ! Riayn started picking up though and sailed through his intense chemotherapy treatment and finished on the 9th March 2010! Riayns hair started growing back he went back to nursery just a few weeks after finishing his intense treatment and I went back to work. Riayn is now on monthly maintenance which means every Monday I do a thumb prick, take it into the blood department and the nurses phone me on Tuesday to give me his blood results. The blood results are needed to see how much medication i have to give Riayn daily and the bloods also tell me if his bloods are low. Riayn still has chemo everyday but it is in tablet form and I give it him at home and once a month he has a chemo called vincristine with a course of steroids for 5 days and he has a lumbar puncture and intrathecal (chemo into spine) every 3 months. Riayn finishes his treatment at the beginning of November 2012. Riayn started big school this September 2012. It was a very emotional day for me and Danny as it made us think back to when Riayn was first diagnosed, how we felt, everything Riayn had been through and now he was starting big boys school. One of the lovely community nurses came every Monday morning into school to do Riayn’s thumb prick for his blood count, Riayn was doing really well but in the first month he picked up quite a few bugs and was in and out of school. We were counting the weeks until he finished treatment and we finally got to another milestone – his last incrusting (chemo) and 5 days of steroids. This day couldn’t have come quicker for us. Vincristine used to hurt Riayn’s joints, he used to grind his teeth and get constipated! The steroids used to make him hyperactive or angry so Riayn had to have sedatives with the steroids. When October 23rd came we were very happy and Riayn went back to school the day after. We went to Alton Towers with PACT who paid for our day tickets and our transport there and back. PACT are an amazing charity and we honestly have no idea how we would have coped without their help and generosity. We are so grateful for everything they have done for use and other families and I will always try and help raise money for them. November 22nd came – the day Riayn’s portacath would be removed. We were so emotional because this was another milestone reached and one we had wished for for so long, and it was finally here! It was also a very emotional day because it was the last time Danny came with me to take Riayn down to theatre was 3 years ago when Riayn was first diagnosed. Danny has missed all the hospital appointments because he has to work very hard to keep a roof over our heads. So the day Riayn was having his portacath removed brought a lot of painful memories back for him but also now happy memories. Danny took Riayn down to theatre where he was in theatre/recovery for about 50 minutes; as soon as we saw Riayn fast asleep we knew everything was going to be OK. The next day at home Riayn asked me where ‘Mr. Wiggly’ was. I explained that ‘Mr. Wiggly’ had gone in the bin. Riayn went into the kitchen and opened the bin; I asked Riayn what he was doing and he replied ‘looking for Mr. Wiggly’. I told Riayn that Mr. Wiggly was put in the hospital bin while he was asleep. He looked a bit confused so I told him that his portacath was no longer there. Riayn had 4 days of oral chemo left to take, I gave him his last oral chemo on November 26th and I cried! It might sound daft but having to give oral chemo therapy nearly every day for the last 3 years used to get me down, your life feels like its on hold sometimes because Riayn could never just stay out for the night. It was hard for me and Danny to have a night out without going out later or one of my sisters having to go and give him his chemo. I was the one who gave him his chemo every day too so it was a lot of stress on my shoulders. Danny did try to do his chemo but we both felt it was best if I did it. Riayn finally finished his treatment on November 27th. We can’t believe its finally over!! Happy happy happy!! Me, Danny and Riayn would like to thank everyone who has supported us through our special little man’s journey. There’s been a lot of downs but more ups for us. We have met some amazing people and made some very special friends. What Riayn has been through has taught me and Danny to open our eyes and be aware and grateful for everything we have. Its made us stronger and more determined and more positive.